We got a good deal on the last batch of wheels - so we are passing on the savings. The new “Piega” forged aluminum 5-spoke wheel incorporates the latest technology in every component, the most innovative aluminum alloy manufacturing and treatment processes, and all the experience of the last 15 years collaborating with the world’s top MotoGP & SBK Championship Teams. OEM Ducati 848 Marchesini wheel set: 19.40 pounds. 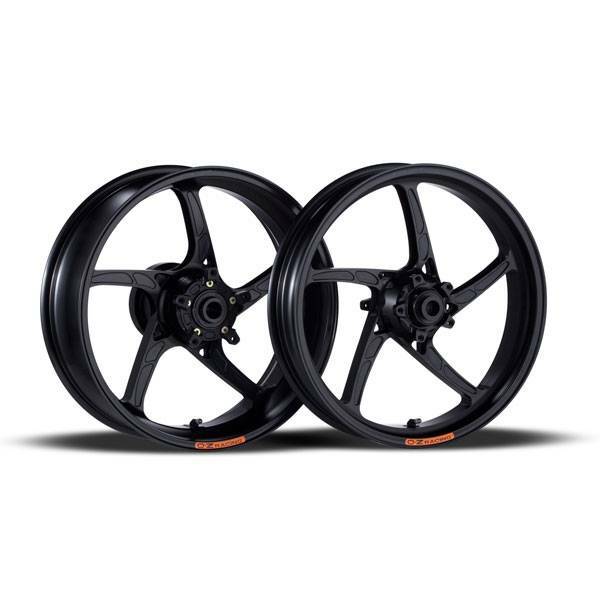 OZ Motorbike forged aluminum wheel set for Ducati 848: 15.90 pounds (18% weight reduction). Major motorcycle manufacturers including Moriwaki, FTR, TSR, RSV, BIMOTA, and BQR have already tested and proven the OZ Motorbike wheels in racing. Reduced wheel weight decreases the moment of inertia which results in quicker acceleration and braking, lowers un-sprung weight and gyroscopic effect to provide quicker turn-in and more positive handling. Specially treated billet aluminum alloy is bi-directionally forged, resulting in a more uniform and stronger metal structure. Dot and JWL approved for street use. FREE continental USA shipping on orders over $100. Last edited by moto; 08-17-2015 at 08:08 PM.